Sawyer Amor is 4 years old. He is a Havanese. 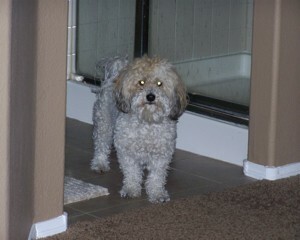 We found Sawyer from a very special lady who is the only Havanese breeder in Las Vegas. He was 16 weeks old and it was love at first site. Sawyer thinks his job is to keep the birds out of our yard, so he chases them so they fly away. He also loves to show off by dancing on his back legs.